PhD (Civil Engineering), The University of Queensland, Australia. M.Eng (Civil Engineering), The University of Queensland, Australia. Graduate Certificate in Higher Education, The University of Queensland, Australia. B.Eng (Civil Engineering), The University of Danang, Vietnam. Vinh is currently a senior lecturer in civil engineering at The University of Queensland, Australia. Vinh's research interests are in the broad areas of structural engineering and fundamental behaviour of concrete/structures.The focus of Vinh's research has been on connecting materials behaviour to structural response of concrete in order to address major issues facing construction industry; with current emphasis on performance of concrete at early ages and at elevated temperatures. Vinh is currently also (i) the Chairman of the Editorial Committee for Concrete in Australia Journal, (ii) an elected National Councillor of the Concrete Institute of Australia, (iii) a key organiser of the UQ-CCAA Advanced Concrete Technology Course and (iv) the Vice-Chair of the 16th East Asia-Pacific Conference on Structural Engineering & Construction (EASEC-16). He has been invited to present a National Seminar Series on “Early-age cracking in concrete structures” in capital cities around Australia, besides many state/industry seminars. Vinh has been lecturing in the areas of structural mechanics, reinforced and prestressed concrete design, concrete technology, and advanced structural engineering. He has received a few nominations for the most effective lecturer from UQ-EAIT Dean’s commendation students and was profiled in Learning@UQ-2012, a major UQ annual publication, for having contributed to high quality of the student experience at UQ. In 2012, he was invited to review curricula for civil engineering programs at the University of Danang (with funding from the World Bank). 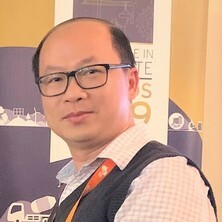 2018-2020: Vinh Dao, Pietro Lura. Early-age cracking in concrete structures: Mechanisms and control, ARC Discovery Project DP180103160. 2017-2018: Vinh Dao, Liza O'Moore, Johnny Ho. Holistic approach to course design and delivery to enhance students’ learning: Effective use of digital technology tools, EAIT Student Strategy Grant. 2017-2019: Jay Sanjayan, Stephen Foster, Brian Uy, Priyan Mendis, Yi-Min (Mike) Xie, Wenhui Duan, Asghar Habibnegad Korayem, Vinh Dao, Zhong Tao, Maurice Guerrieri, Syed Masood, Emad Gad, John Wilson, Sujeeva Setunge, Chunhui Yang. Three-dimensional concrete printing facility, ARC LIEF LE170100168. 2017-2019: Andrei Kotooussov, Giang D Nguyen, Arcady Dyskin, Elena Pasternak, Phillip Dight, Dr Jie Pan, Dr Ha Bui, Wenhui Duan, Chun Wang, Pier Marzocca, Martin Veidt, Nangallage Fernando, Vinh Dao, Cara MacNish, Stuart Wildy. Bridging time/size scales in strain measurements with advanced DIC facility, ARC LIEF LE170100079. 2015-2017: Vinh Dao, Jose Torero Cullen, Johnny Ho, Liza O'Moore, Luke Bisby. Fire performance of concrete using novel fire testing, ARC Discovery Project DP150102354. 2013-2015: Faris Albermani, Jose Torero Cullen, Sritawat Kitipornchai, Martin Veidt, Vinh Dao, Mark Bradford, Guowei Ma, Mahen Mahendran, Michael Griffith. Performance level structural testing facility, ARC LIEF LE130100089. 2009-2010: Peter Dux, Vinh Dao, Liza O'Moore. Development of a new and sustainable practical geopolymer concrete for building and infrastructure applications, UQ FirstLink Scheme. Our current knowledge of concrete performance in fire remains largely based on data from conventional tests in which the thermal loading experienced by concrete specimens is very difficult to be consistently controlled. As a result, the effect of temperature gradients within concrete on its fire performance has not been adequately investigated; neither has the influence of critical processes linked with temperature gradients (including thermal stresses, moisture transport, and pore pressures) – This knowledge gap is critical due to the likely significant temperature gradients within concrete in fire. This line of research, through addressing major shortcomings of current “standardized” tests for concrete in fire, aims to address the above-mentioned knowledge gap. Early-age cracks and their further development at later ages can seriously compromise the integrity, durability, aesthetics, and long-term service life of wide-ranging types of concrete structures. Despite significant ongoing research, problems in early-age concrete remain among the most common causes of litigation in current construction industry. This line of research, through addressing major existing gaps, aims to provide a holistic understanding of the key phenomena and factors underlying the performance of early-age concrete, leading to more effective crack control in concrete structures. This line of research covers structural material characterisation, advanced structural design, computational methods and experimental techniques. Investigating fundamental properties and behaviour of newer types of concrete, including geopolymer concrete and self-compacting concrete. This line of research aims to develop more reliable models for service-life prediction of coastal reinforced concrete structures. Dao, Vinh T. N. (2014) Performance of concrete in fire. Concrete in Australia, 40 3: 50-53. Dao, Vinh T. N., Dux, Peter F., Morris, Peter H. and Carse, Alan H. (2010) Performance of permeability-reducing admixtures in marine concrete structures. ACI Materials Journal, 107 3: 291-296. Dao, Luc The Ngoc, Dao, Vinh The Ngoc, Kim, Sang-Hyo Kim and Ann, Ki Yong (2010) Modeling steel corrosion in concrete structures - part 1: A new inverse relation between current density and potential for the cathodic reaction. International Journal of Electrochemical Science, 5 3: 302-313. Dao, Luc The Ngoc, Dao, Vinh The Ngoc, Kim, Sang-Hyo Kim and Ann, Ki Yong (2010) Modeling steel corrosion in concrete structures - part 2: A unified adaptive finite element model for simulation of steel corrosion. International Journal of Electrochemical Science, 5 3: 314-326. Dao,Vinh T. N., Dux, Peter F. and Morris, Peter H. (2009) Tensile properties of early-age concrete. ACI Materials Journal, 106 6: 483-492. Early-age thermal cracking in concrete structures – The role of zero-stress temperature? Dao, Vinh The Ngoc, Nguyen, Duy and Lura, Pietro (2016). Early-age thermal cracking in concrete structures – The role of zero-stress temperature?. In: Hoang Nam and Dang Dang Tung, Proceedings of the Fourteenth East Asia-Pacific Conference on Structural Engineering and Construction (EASEC-14). Fourteenth East Asia-Pacific Conference on Structural Engineering and Construction (EASEC-14), Ho Chi Minh City, Vietnam, (692-698). 6-8 January 2016. Dao, V. T. N. (2015). Early-age thermal cracking in concrete. In: J. G. Teng, Proceedings of the Second International Conference on Sustainable Urbanization. Second International Conference on Sustainable Urbanization (ICSU 2015), Hong Kong, China, (43-43). 7-9 January 2015. Fire performance of concrete: effect of temperature gradients? Le, Quang X., Dao, Vinh and Torero, Jose L. (2015). Fire performance of concrete: effect of temperature gradients?. In: Venkatesh K. R. Kodur and Nemkumar Banthia, Response of Structures Under Extreme Loading. PROTECT2015 - Fifth International Workshop on Performance, Protection and Strengthening of Structures under Extreme Loading, East Lansing, MI, United States, (189-196). 28-30 June 2015. Nguyen, Duy and Dao, Vinh T. N. (2015). Tensile properties of early-age concrete. In: Jay Sanjayan, Construction Innovations, Research into Practice: Proceedings of the 27th Biennial National Conference of the Concrete Institute of Australia in conjunction with the 69th RILEM Week. 27th Biennial National Conference of the Concrete Institute of Australia in conjunction with the 69th RILEM Week, Melbourne, VIC, Australia, (1314-1324). 30 August - 2 September 2015. Nguyen, Duy and Dao, Vinh (2014). A novel method for tensile testing of very early-age concrete. In: Scott T. Smith, Proceedings of the 23rd Australasian Conference on the Mechanics of Structures and Materials (ACMSM23). Australasian Conference on the Mechanics of Structures and Materials, Byron Bay, NSW, Australia, (47-52). 9-12 December 2014. Dao, Vinh, Morris, Peter H. and Dux, Peter F. (2013). Crack propagation in concrete at early ages. In: Vinh Dao and Peter Dux, 26th Biennial Conference of the Concrete Institute of Australia Conference Proceedings. 26th Biennial Conference of the Concrete Institute of Australia, Gold Coast , Australia, (). 16-18 October 2013. Buswell, William and Dao, Vinh (2013). Pile cap design using strut-and-tie modelling. In: Vinh Dao and Peter Dux, Concrete 2013: Conference Proceedings. Concrete 2013: 26th Biennial National Conference of the Concrete Institute of Australia, Gold Coast, QLD, Australia, (1-10). 16-18 October, 2013. Dao, V. T. N., Morris, P. H. and Dux, P. F. (2010). Fracture mechanics of early-age concrete. In: Byung Hwan Oh, Fracture Mechanics of Concrete and Concrete Structures: 1. Recent Advances in Fracture Mechanics of Concrete. Proceedings of the 7th International Conference on Fracture Mechanics of Concrete and Concrete Structures (FraMCoS-7). 7th International Conference on Fracture Mechanics of Concrete and Concrete Structures, Jeju, Korea, (95-99). 23-28 May 2010. Morris, P. H., Dux, P. F. and Dao, V. T. N. (2010). Snap-through cracking in plastic concrete slabs. In: Byung Hwan Oh, Fracture Mechanics of Concrete and Concrete Structures: 1. Recent Advances in Fracture Mechanics of Concrete. Proceedings of the 7th International Conference on Fracture Mechanics of Concrete and Concrete Structures (FraMCoS-7). 7th International Conference on Fracture Mechanics of Concrete and Concrete Structures, Jeju, Korea, (363-369). 23-28 May, 2010. Dao, V., Dux, P. F. and Morris, P. H. (2008). Tensile properties of early age concrete. In: R. K. Dhir, T. A. Harrison, L. Zheng and S. Kandasami, Concrete Durability: Achievement and Enhancement. International Congress on "Concrete: Construction's Sustainable Option", Dundee, United Kingdom, (469-480). 8-10 July 2008. Dao, Vinh, Morris, P.H. and Dux, P.F. (2008). Thermodynamic equations for total, matric and osmotic suctions. In: R. K. Dhir, T. A. Harrison, L. Zheng and S. Kandasami, Concrete Durability: Achievement and Enhancement. International Congress on "Concrete: Construction's Sustanable Option", Dundee, United Kingdom, (281-290). 8-10 July 2008. Dao, V., Dux, P. F. and Morris, P. H. (2007). Effectiveness of permeability-Reducing admixtures in marine concrete. In: F. Toutlemonde, K. Sakai, O. Gjorv and N. Banthia, CONSEC'07. 5th International Conrete under Severe Conditions Environment and Loading (CONSEC'07), France, (449-456). 4-6 June 2007. Dao, V., Dux, P. F. and Carse, A. (2005). Corrosion of steel reinforcement in concrete structures exposed to coastal environments - Its causes and corrective measures. In: Problems and failures of building structures. 3rd national congress on problems and failures of building structures, Hanoi, Vietnam, (355-364). 25 November 2005. Dao, V. N., Dux, P. F. and Morris, P. H. (2005). Plastic shrinkage cracking in concrete - its causes and preventive/corrective measures. In: 3rd national congress on problems and failures of building structures. 3rd national congress on problems and failures of building structures, Hanoi, Vietnam, (348-354). 25 November 2005. Concrete 2013: conference proceedings. Understanding concrete (2013) . Edited by Vinh Dao and Peter Dux. Concrete 2013: 26th Biennial National Conference of the Concrete Institute of Australia, 16-18 October, 2013, Gold Coast, QLD, Australia. Dao, Vinh The Ngoc (2007). EARLY-AGE CRACKING OF CONCRETE PhD Thesis, School of Engineering, University of Queensland.